Get the Smartphone Video Storytelling textbook used by top instructors. The workshop with Robb was just fantastic. It was easy to learn the steps how to film and editing with the smartphone. I highly recommend this workshop tour for everyone! Robb’s film class was magnificent! He is friendly, easy going, and knows how to convey what is important in a quick and easy way — even for me as a beginner. I highly recommend this! 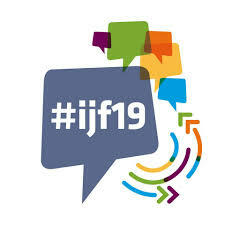 Every April the International Journalism Festival produces no-cost #MOJO clinics and workshops in Perugia, Italy. In 2018 several Mobile journalism Smartphone Films won top film festivals and debuted on digital cinema screens at real theaters from Sydney to Los Angeles. Mobile Journalism training will be offered in German language by ReporterFabrik. Mobile Journalism Course Campus license available for education pricing. Are you looking for an up-to-date Mobile Journalism Course- Campus license to help you and your students master smartphone video storytelling and mobile journalism? Smartphone Video Storytelling is designed for instructors to help their students quickly master the techniques for making compelling short-form video content with a smartphone. 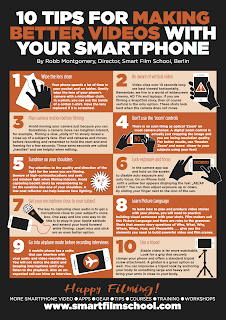 Mobile Journalism PDF Shoot and edit smartphone video like a pro with these quick tips. Request a PDF of this poster that you can hang in your classroom.